Galicaster-PRO (GC-PRO) is a powerful lecture and conference recording software. Running on the recommended Hardware it builds a fully featured multi-stream recording unit. GC-PRO is based on a compiled, optimized and enriched version of Galicaster Community-Edition Software. Galicaster PRO has the following ways to stream your content. All of them can be either pushed to an external streaming server or Galicaster can act as a streaming server itself for a small number of clients. With the same quality they are being saved to file (really high quality, high bandwidth). Can be used for campus-wide distribution. Static Blending: Blend and Stream a Side-By-Side stream, as a result of a predefined 50-50 split screen with the two video inputs composed as a single stream. This layout can be changed. Additionally this stream can also be saved to a file. 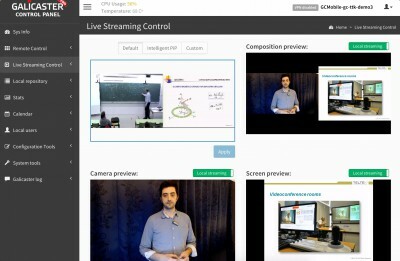 Intelligent PiP: An advanced PiP blended stream, where analyzing in realtime the presentation video stream, we detect free space in a selected corner of the frame and overlay the presenter over that free space, so we have a PiP video that dynamically adapts and takes advantage of that free space and that can be recorded to disk and/or streamed as it is. This solution is particularly useful for streaming to small screen devices (namely mobile phones or tablets) as it takes real good advantage of the screen real state while keeping the MH premise of delivering two video streams. MANY MORE FEATURES COMING VERY SOON !! Live audio and video feedback over a touch interface. Visual alarm on muted or low level audio. Advanced media manager, allowing playback, metadata edition and sorting and export operations. Opencast Matterhorn compatible, performs schedule and automatic ingestion. Basic manual controls of the recording: starting, stopping and pausing. HD and SD recording supported from HD-SDI, HDMI, component and composite video sources. Support for RTP network cameras and Datapath capture cards. VGA and DVI presentation recordng supported. Opencast-Matterhorn 1.x and 2.x compatibility. How to Buy GC-PRO ? Usually GC-PRO is bought as part of a Galicaster-Unit. All Galicaster-Units now include GC-PRO pre-installed. Under certain conditions GC-PRO can be bought as a SW license. Special discounts for Education available.